My name is Kristen Guinanne, and I was born in California to a large Irish Catholic family. I'm one of about 30 grandchildren. My parents divorced when I was about three years old. My mom moved us from California to Michigan. My childhood was rough to say the least. I would only see my father and his family once a year. I am now no longer in touch with my mother for many reasons. I am very close to my father and "Ma" (stepmom). Dad and I have our weekly chats and I'm very grateful to have his support and understanding. I'm also very close to my grandma and godmother. From day one, those women have been my rock! I was born into a large Irish Catholic family. 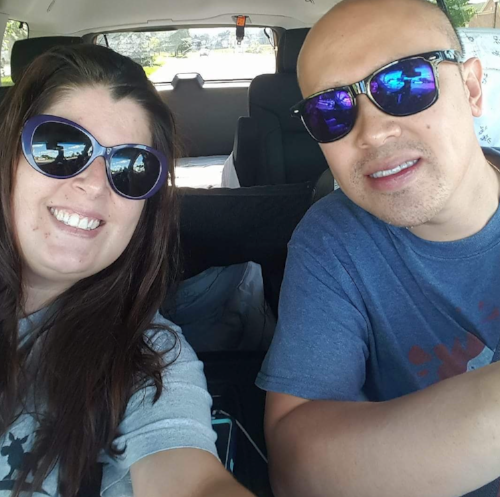 Meet Ken and Kristen... We're a Team! Kristen and Ken... together forever! I realized that I wanted to be a mother when I got pregnant with our first baby. I knew Ken was the one with whom I wanted to have children. I was twenty-eight and ready to be a mom. Our first pregnancy/loss happened quickly. We got pregnant about three months into our relationship. Ken and I were very happy and excited to be pregnant; and we were especially surprised that it happened so fast! Unfortunately, about a week after getting the positive home pregnancy test, I started to spot. At the time, I was living with my best friend and her family. Her mom took me to the emergency room. They rushed me back for an ultrasound to check on the baby. Well, come to find out, I had a “blighted ovum.” The tech and doctors were all very kind and understanding. To say I was heartbroken was an understatement! The ER doctor called my OB-GYN and the nurse/midwife on call came down to consult with me regarding my options. I chose to have a natural miscarriage and was given narcotic pain meds. I took a week off from work. July 4, 2010 is our first “angel’s birthday.” We lost “Baby Che” at 6 weeks. Moses, our German Shepard, was our "miscarriage puppy." Bailey is our Lab. We love our fur babies so much. Our second pregnancy happened about six or seven months later. I found out that I was pregnant the morning of Ken’s birthday. We were ecstatic! I was told that it is very common to have an early miscarriage for our first pregnancy, but we were also reassured that we shouldn’t have any issues with our next one. Well, about seven or eight weeks into the pregnancy, I started to spot again. Our hearts sunk! Again I went to the ER for an emergency ultrasound. This time we saw a beautiful bouncing baby and there was a heartbeat! P.S. A note to all doctors… an early miscarriage is not just “an extra heavy/painful period.” It is labor and to not acknowledge it is wrong. Baby Che #2 was born on April 2, 2011, on our first anniversary. Fast forward six to seven years and several chemical pregnancies later, we conceived our third angel baby. After our second loss, we were diagnosed with two genetic mutations. I am heterozygous MTHFR C677T, which means I cannot absorb synthetic folic acid properly. AND I have the Prothrombin gene G20210A, which means that I have a blood clotting disorder. I have to be on blood thinners for the rest of my life. At that time, they have attributed our first two losses to those mutations. We had a game plan this time. Because of the trauma from the first two losses, it was hard to be happy and relaxed with this pregnancy. With every wipe, I was scared. We were both scared. Our doctors and nurses watched the baby and me like a hawk. My levels were regularly checked. Well, my numbers were taking three days to double so I went in to have an ultrasound. The baby looked good! However, due to our history, I had ultrasounds weekly! I was doing well and feeling good. Well, the day after my first prenatal appointment, I started to spot. We were again sent to the ER at the advise of my nurse. Of course, they wanted to do one more ultrasound! The baby looked good. It had a good heartbeat! I was sent home because the doctor on call thought I had a SCH (Sub-Chorionic Hematoma) which delayed implantation and caused bleeding. We had to go back the next night and our sweet baby, Gabriel, was gone. Again my OB team took care of me. On February 4, 2017, I again miscarried naturally. I begged for a D&C because I didn't want to be home suffering my miscarriage, and I wanted it over and done with. Because my regular OB wasn't available, the OB-GYN on-call advised me to let my body handle it because it was already starting the process. So, I didn't get a D&C and had to labor for two days to deliver Baby Gabriel. This silhouette of a mother kissing her angel baby is a favorite image of Kristen's. The "silver lining" in all of this is after a third loss, insurance kicks in and covers the necessary testing. (By the way... please make sure that you and your partner have a good team of doctors and nurses.) After all our visits and tests, our losses are attributed to low progesterone. I felt good that my team of doctors discovered the root of my problem. I realized that going forward with treatment, I could still have a healthy baby with pre-genetic embryo testing. The pea pod has come to mean so much to me. 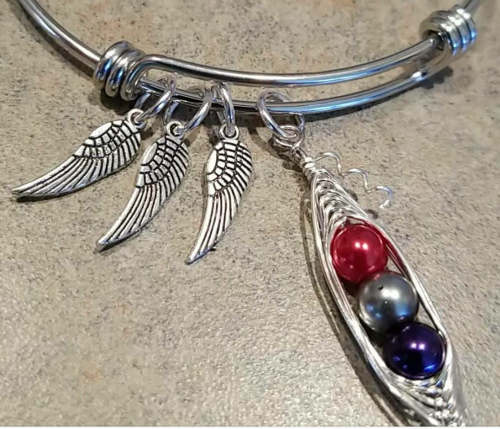 I won the bracelet through a Facebook contest, offered by a woman who creates jewelry for those who suffer infant lost. The pearls in the pod are the birthstone colors of my three angel babies who have gained their angel wings. There are so many lows in our journey that I don’t think I have the time or the strength to go over them. But one of the lowest was a comment from a priest, who said, “Maybe it’s a sign from God that you should marry.” We are Catholic… not super devout… but we are good people. I don’t think he understood where we were coming from. We also have a difficult time when some of our friends don’t support us, too. It makes an incredibly difficult situation all the harder. At that point, we made it our mission to get healthier both mentally and physically. It was so difficult for both of us. We have been through so much. You would think that we wouldn’t find any highs or positivity on our journey, but there have been a lot. The support groups on Facebook and in person have been amazing. We decided to surround ourselves with supportive, positive people. For Ken, it has been especially good. The best part for me is when I met some local women on a Facebook support group. 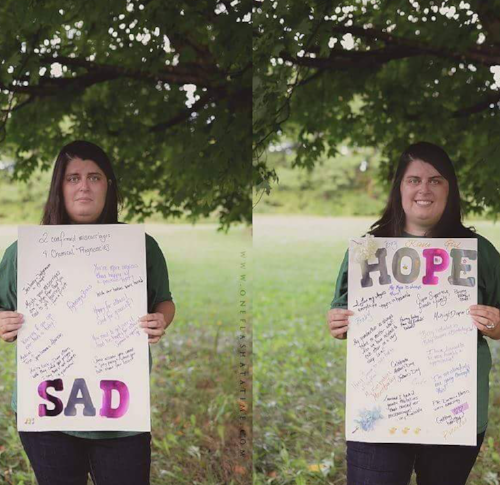 I participated with an infertility photo project. My friends, Faredae and Jaci, invited the members of our group to meet at a rural outdoor location, which was lush, gorgeous and green. Once we were altogether, we shared our pre-written statements on cards which contained both bad and yet hopeful things that had happened to us. We stood and read our cards with the group while Jaci took pictures of us. It was profound to see how infertility had affected us to the core of our being. Ken was so happy that I joined this group. As I told him, getting involved with the group was for us. The exercise of sharing our hopes and our sadness was very therapeutic. I'm grateful to my support groups. Another positive aspect of facing infertility is discovering the strength and resilience of our relationship. We couldn’t have come this far without supporting each other. I learned about RESOLVE from my dear friend and inspiration, Faredae Miller. I am forever grateful for all the friends I have made through this wonderful support group. Ken and I have found so much strength through our friends and family. Because of my grandmother and my very good friends (BFFs, you know who you are) we have found happiness. I have a favorite quote that really speaks to me. It has helped me at the darkest times of my journey... especially on my angel-versaries. 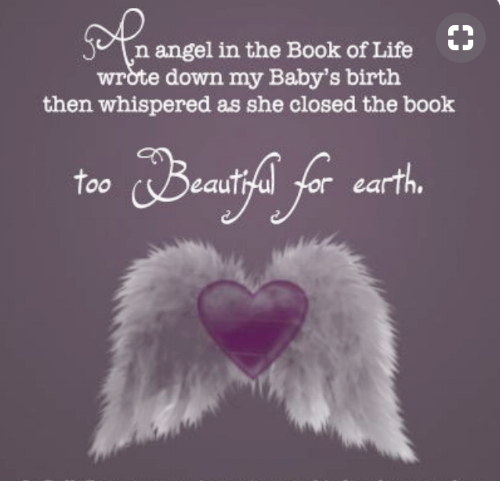 "An angel in the book of life wrote down my baby's birth. Then whispered as he closed the book, too beautiful for earth." Take advise with a grain of salt. Don't ever feel ashamed about your miscarriages. Look for humor and positivity in every day. Find your "tribe" as soon as possible. Follow your heart and do what is right for you.